Formed in 1999 by Liang Long in his home town of Harbin (Heilongjiang province NE China), the band Second Hand Rose represents a dynamic mix of Chinese musical and cultural heritage with transnational rock music traditions. Liang moved to Beijing in 2000, and has picked up new members along the way while staying true to his original vision for the band as a melding of high-energy rock with Chinese instrumentation and poetry traditions. Originally known as “Second Hand Rose Band,” the group shortened their name to simply “Second Hand Rose” after releasing a second album in 2006, The World of Entertainment. 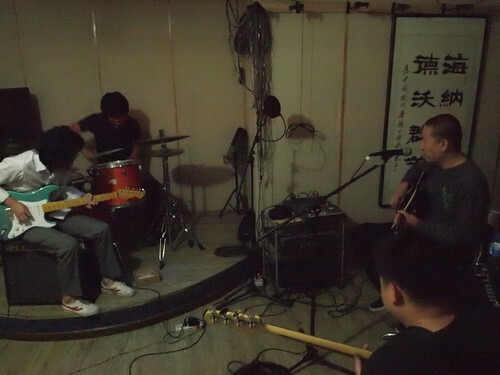 Liang developed the band name in response to a wave of “copy cat” Chinese rock acts that he encountered in the late 1990s, groups he saw as mimicking Western rock and roll without injecting any of their own identity or creativity into the music. Offering an ironic commentary on this trend, he opted to directly critique the “used” or recycled aspect of his contemporaries’ efforts with the phrase “second hand.” He intended for the moniker to illuminate his artistic goal of creating original music that flowed simultaneously from Chinese and Western sources. For Liang, the word “rose” signals beauty, growth, and change—foregrounding the vitality and creativity the band has come to embody in performance and on record.